Per capita average annual freshwater availability is gradually reduced due to increasing population, urbanization and affluent lifestyles. Hence, management of wastewater is of great concern. 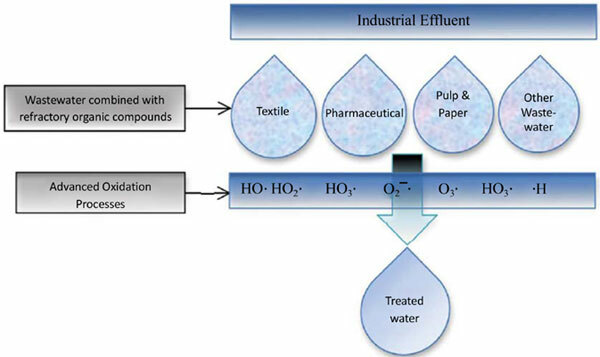 The wastewater from different industries can be treated by various conventional treatment methods but these conventional treatment technologies seem to be ineffective for the complete removal of pollutants especially refractory organic compounds that are not readily biodegradable in nature. Detergents, detergent additives, sequestering agents like EDTA, Pesticides, Polycyclic aromatic hydrocarbons, etc. are some of the recalcitrant organic compounds found in the wastewater. One of the treatment technologies for the removal of recalcitrant organic compounds is Advanced Oxidation Process (AOP). The production of hydroxyl free radical is the main mechanism for the AOP. AOP is a promising technology for the treatment of refractory organic compounds due to its low oxidation selectivity and high reactivity of the radical. Hydrogen peroxide (H2O2), Ozonation, Ultra-violet (UV) radiation, H2O2/UV process and Fenton’s reaction are extensively used for the removal of refractory organic compounds thus reducing Chemical Oxygen Demand (COD), Total Organic Carbon (TOC), phenolic compounds, dyes etc. to great extent. From the studies, we found that Fenton’s reagents appear to be most economically practical AOP systems for almost all industries with respect to high pollutant removal efficiency and it is also economical. From the energy point of view, the ozone based process proves to be more efficient but it is costlier than the Fenton’s process. Advanced oxidation process, refractory organic compounds, wastewater, hydroxyl free radical, ultraviolet radiation, Polycyclic aromatic hydrocarbons.